Last month’s unemployment rate remained unchanged from December at 5.3pc, according to figures from the Central Statistics Office (CSO). Pawel Adrjan, economist at global jobs site Indeed, said expectations of unemployment falling below 5pc this year will hopefully be met “sooner rather than later”. However, he added that the “dark cloud of uncertainty” of Brexit looms as a large threat. 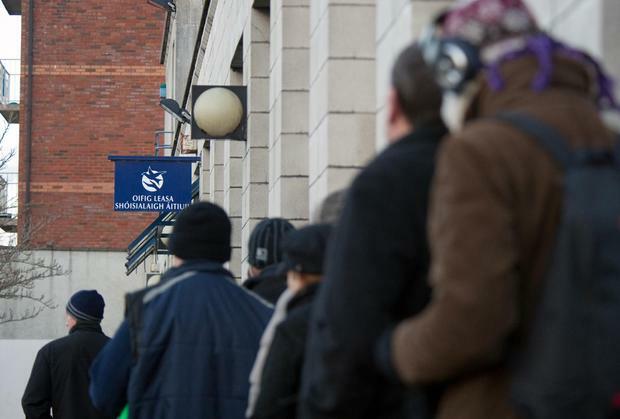 The Department of Finance recently warned that the unemployment rate could rise by two percentage points in the event of a no-deal scenario that saw Britain crash out of the EU on March 29, Mr Adrjan said. “This would make it harder for Ireland to absorb the increase in jobseeker interest that has been seen from both the UK and the rest of Europe since the Brexit vote,” he warned. For males, the seasonally adjusted unemployment rate was 5.2pc last month, down from 5.3pc in December 2018, and down from 6.1pc in January 2018. Meanwhile for females, the seasonally adjusted jobless rate was 5.4pc in January, which was unchanged from December 2018 and down from 5.8pc in January 2018. Youth unemployment – those aged between 15-24 – increased marginally to 12.4pc, from 12.2pc in December. In separate figures from the CSO, production for the manufacturing industry in December decreased by 14.2pc, compared to November 2018. On an annual basis production for December 2018 was 18.9pc lower than in December 2017. The main decrease came from the ‘modern’ sector, which includes pharma.